Although the Lafayette Urban Ministry was officially incorporated in 1972, its roots go back to 1962 and the work of the Neighborhood Development Project. NDP was started by a Purdue University student along with Doris Hanstra, wife of Hope Chapel Presbyterian Church pastor Rev. Peter Hanstra. Operating out of Hope chapel, NDP offered crafts and camp programs which attracted mostly south-side neighborhood youngsters. During the fall of 1966, an advisory board was created to watch over NDP and its use of Hope Chapel facilities. 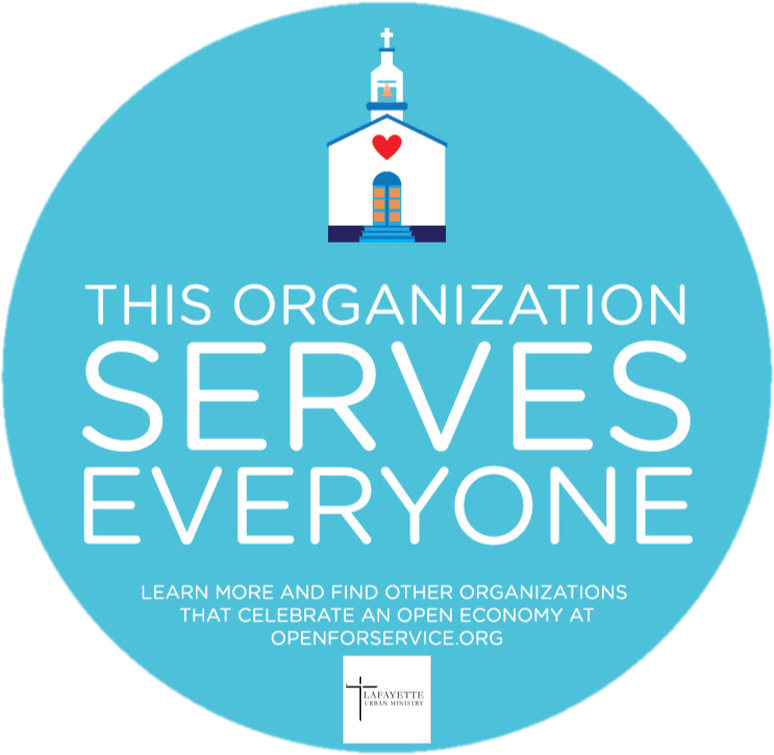 to seek the cooperation of the United Methodist church and the Roman Catholic Church in obtaining a second staff member for this urban ministry. The Presbyterian churches will need to approach other churches with a fairly definite plan and the question of whether they want to be included. Mrs. Dee Tritchler moved and Les Gaylor seconded to change the name of the Neighborhood Development Project to Lafayette Urban Ministry, passing all the assets and liabilities of the one to the other. This was passed unanimously by all present. Rev. Beswick moved and Les Gaylor seconded to ask Central Presbyterian Church for office space in 1972. This passed unanimously. The Lafayette Urban Ministry was officially incorporated as an Indiana Not-For-Profit Corporation on October 16, 1972. Seven churches were represented as charter members: Covenant Presbyterian, St. Andrew United Methodist, First United Methodist, Central Presbyterian, Dayton Presbyterian, Hope Chapel, and Bethany Presbyterian. Early programming at LUM was organized around three general issue areas: community development, youth, and aging. A Spanish-speaking and revenue sharing task force were started. The centralized emergency fund also began with the financial support of 13 churches. Seventy-two people were helped in 1975. Adventure clubs and summer camp continued for youth. Good friends and volunteer transportation programs were geared toward the low-income aged. Thanks to funding from the Lilly End owment, research began which resulted in the publishing of the LUM Green Book — officially entitled The Lafayette Urban Ministry: A Model for Urban Ministries and an Evaluation of LUM and written by James D. Davidson, Purdue Sociology and Anthropology in collaboration with Ron Elly; Thomas Hull, LUM president; and Don Nead, campus pastor, University Church — the Dream Team. This report used LUM as a model for urban ministries who engage local churches in social concerns and action, particularly of low income families. It included the model for urban ministries that was developed and proposed by the LUM Board in 1976. The report concluded with an evaluation of LUM based on the model and gave specific recommendations. The Green Book has become legendary within Lafayette Urban Ministry and still is relevant and worth reading today. By the time Rev. 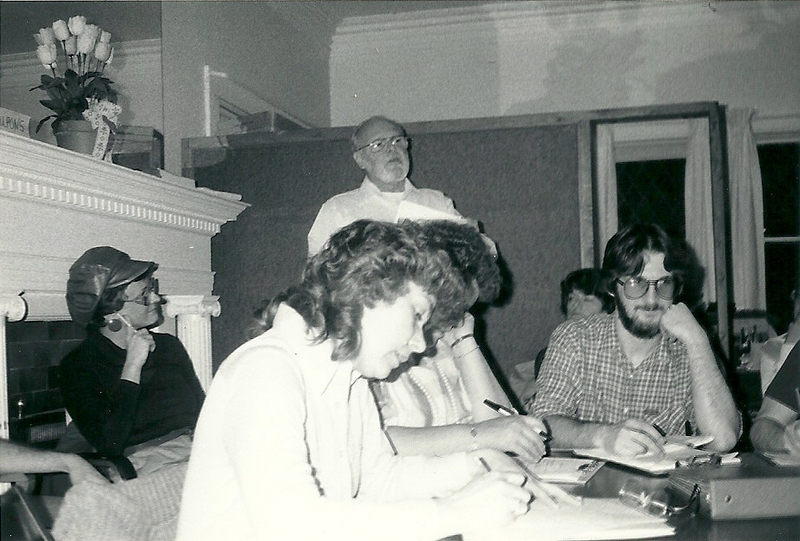 Elly resigned as the LUM director in October 1977, the LUM Board of Directors had grown to 22 churches and four paid staff members. After the resignation of Rev. 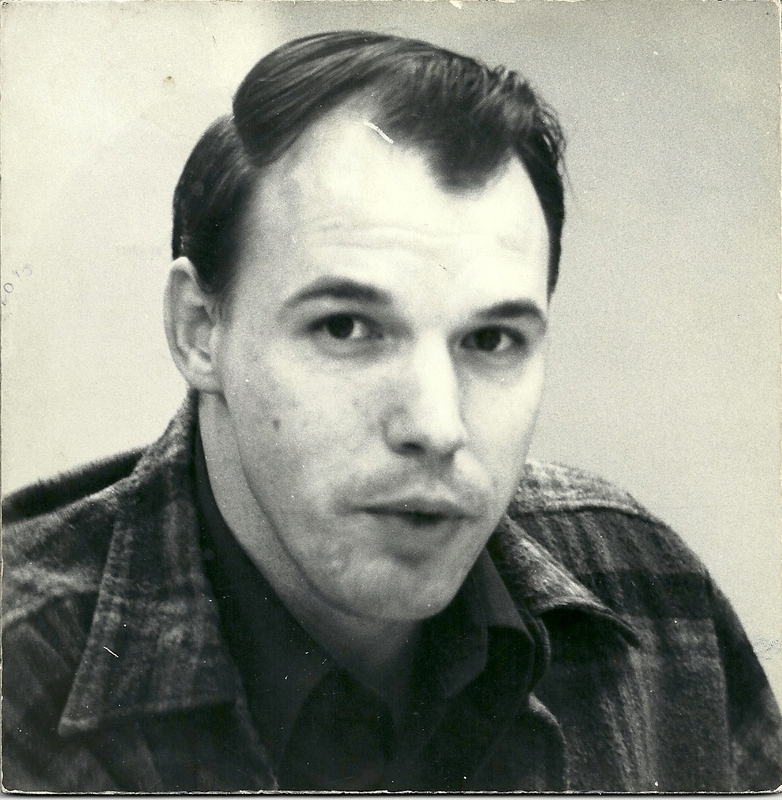 Ron Elly in September of 1977, the LUM Board appointed the Rev. Kremlick, Pastor of Dayton Memorial Presbyterian Church, as interim head of staff. On January 11, 1978, the LUM Board of Directors and pastors of member churches interviewed Rev. Jud Dolphin and voted to call him as the new LUM Executive Director. Rev. Dolphin took over in March 1978. By 1981 LUM had grown to 29 member churches and a staff of four. LUM program also expanded to include the first Seeds of Vision Conference, Grow-A Row, Repairs On Wheels, and Jubilee Christmas. LUM Camp and the Centralized Emergency Fund continued while the volunteer transportation program was transferred to the Tippecanoe Senior Center. A Public Policy Committee began to meet monthly to discuss the broader social justice issues facing LUM clients. A staff member was assigned to the committee and a quarterly newsletter, Agenda for Social Concerns, was published. Soon thereafter, the LUM Board further expanded its Social Justice programming by creating the Indiana Task Force on Poor Relief. LUM’s influence reached statewide as a network of 11 ecumenical ministries was engaged to help bring reform to Indiana’s ailing township poor relief system. Legislation was introduced before the Indiana General Assembly, several research projects were conducted, and a statewide media and advocacy campaign was launched. A monthly newsletter, The Overseer, was published. And LUM established itself as a statewide voice for the public policy concerns of public assistance recipients. In 1984 LUM and St. Thomas Aquinas established Lafayette’s first emergency shelter for the homeless. 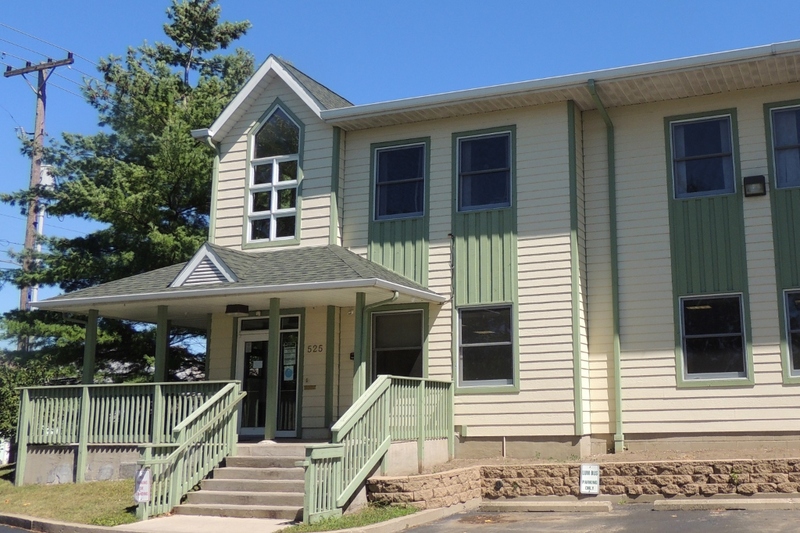 The shelter was housed on the second floor of LUM’s 8th street office and was moved to St. Boniface Church in 1987. Subsequently, the shelter was included in the main LUM building when it was built at 525 N. 4th Street. After a year-long evaluation in 1988 the Poor Relief Task Force was reorganized into Indiana Welfare Watch. Still active in policy concerns of needy Hoosiers, the program grew to include a Board controlled by the welfare recipients and a more comprehensive issue agenda. In 1988 LUM also formed the Local Government Watch, a community based organization of 200 LUM clients seeking to influence reforms in the administration of poor relief in Fairfield Township. On August 15, 1990 Rev. Dolphin resigned as the LUM executive director to accept the position of Senior Field Organizer with the Washington D.C. based Food Research Action Center. Under his leadership the LUM annual budget had grown from $58,620 to $278,790. LUM grew from 10 to 21 programs, 22 to 35 member churches and from a staff of four to a staff of eight. Jo Johannsen was appointed Interim Executive Director by the LUM Board of Directors. On October 10, 1990 Joseph Micon received a final interview by the LUM Board and was appointed as the third LUM Executive Director with duties that began October 15, 1990. A Roman Catholic, Micon was a product of Catholic education. He received his Master’s Degree in Social Work from Indiana University in 1983 with a special training in the administration of Not-for-Profit organizations. 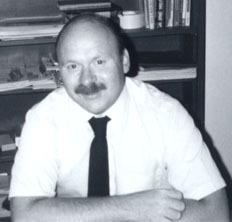 He had served various LUM staff capacities since 1980. Like the previous LUM executive directors, Micon also shares a strong commitment to integrating the charitable components of social ministry with the social justice components. A special emphasis on the problems of children and families in poverty helps direct the program. Let’s Do Lunch, the CCHIP, childhood hunger study, and a babysitting room for LUM clients were new additions to LUM programs. In addition, the LUM food pantry, emergency shelter and centralized emergency fund were all expanded. New advisory councils for pastors as well as LUM clients were added by the Board. LUM ended its first 20 years of ministry with 44 member congregations, 7 permanent staff members, 1500 volunteers and an annual budget of $299,400. Twenty-three programs of service, self-help and advocacy reached 70% of Tippecanoe County’s poor. In October 1992 LUM celebrated its 20th Anniversary with an awards banquet and worship service. In 2012, LUM celebrated its 40th Anniversary with the LUM Good Samaritan Fund Follies fundraising event with silent auction. LUM Follies became an annual event to raise funds and aware for the Good Samaritan Fund, Good Samaritan Program & the ID Clinic. LUM began using social media as a part of the 40th anniversary as well. Although the future of LUM has not yet been written, its work of serving and helping will continue.